For full bibliography for 1960, 1970, 1980, 1990, or for 2000 follow links. See also: 1995 (for links to earlier decades), 1997, 1998, 1999 with links to later years. Also see list of personal scientific publications for the 1990's and 2000's. BJF, 1996, Science Column (8): Modern Marvels [Soho in space; Chinese satellite; Word virus; apple genes; gum germ], Boz magazine, 21: 10, January. Report, 1996, Brian J Ford with young members at Junior Mensa at Cambridge (photograph), Foundation for Gifted Children brochure: 2-3, January. BJF, 1996, Brian Wave Column (22): Fast Forward, Mensa Magazine: 12, January. BJF, 1996, How Science Really Happened (lecture to Euemenides), Godmanchester, Cambridge, 1930h, 15 January. BJF, 1996, The Nature of Innovation (reprinted from Biologist, 1995, 42 (5): 236-238), Hong Kong: School of Research Studies Newsletter, 3 (5): 1-4, January. BJF, 1996, Brian Wave Column (23): Pupil Power, Mensa Magazine: 12, February. Report, 1996, Brian J Ford as Leeuwenhoek in Chicago (with photograph), Focus - New York Academy of Sciences Newsletter: 15, February. BJF, 1996, Science Column (9): Modern Marvels [Questionnaire; cocaine vaccine; Concorde; W-95; Cycliophora], Boz magazine, 22: 11, February. Andersen, Hanne, 1996, Review of Images of Science, Centaurus 38: 93-94. BJF, 1996, Chairman of Sixth Form Lecture, Patrick Riley on Cancer, a Biological Enigma, London: Linnean Society, 22 February. BJF, 1996, Brian Wave Column (24): Talking shop, Mensa Magazine: 12, March. Barnhurst, Kevin, 1996, [Review of Images of Science], Les frauduleux, Science and the Crisis of Representation, Journal of Communication, 46 (1): 159-168. 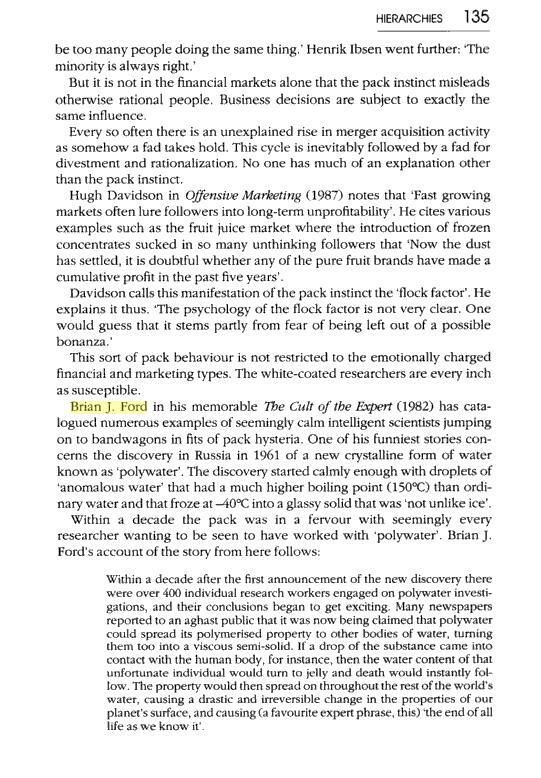 Johnson, Gary, 1996, cites Brian J Ford's Cult of the Expert [in] Monkey Business, London: Gower Press. BJF, 1996, Science Column (10): Modern Marvels [HRT, Computer checks, fish stocks, wind and depression], Boz magazine, 23: 7, March. Biography, 1996, Brian J Ford [in] Who's Who in Science and Engineering, 3rd edition, New York: Marquis Press. (Cross-referenced in Who's Who in America, 50th edition). Announcement, 1996, Brian J Ford to chair Mensa at Cambridge 'The Golden Age' at Magdalene College Cambridge, Mensa Magazine: 35, March. BJF, 1996, Ignoring Daisy's case was the first big BSE mistake, London Evening Standard: 7, 21 March. Hopkin, Steve, 1996, [cites Brian J Ford's Images of Science in] Geoffroy, J-J, Mauriès, J-P, & Nguyen Duy-Jaquemin, M, (eds) Acta Myriapodologica, Mémoires de la musée nationale d'histoire naturelle, 169: 25-34, Paris. BJF, 1996, Brian Wave Column (25): Money Talks, Mensa Magazine: 12, April. BJF, 1996, Cells, the Ultimate Microdots (with micrograph of Ribes), Biologist, 43 (2): 96. BJF, 1996, National Science? Weak, Laboratory News: 14, April. BJF, 1996, Science Column (11): Modern Marvels [Genetic tomato, Morrisey cancer, photocopiers], Boz magazine, 24: 9, April. Sampson, M, and Nixon, M, 1996, Brian J Ford as adviser to exhibition, Archives of the Scientific Revolution: i, London, April-June. Sampson, M, 1996, [Refers to Brian J Ford research in] Archives of the Royal Society, paper for Archives of the Scientific Revolution, London: Royal Society, 12 April. Report, 1996, Mad rush for BSE book, The Bookseller: 35, 3 May. BJF, 1996, Science Column (12): Modern Marvels [BSE book, wine, dust storms], Boz magazine, 25: 9, May. Hart, Vanessa, 1996, Mad cow cannibal theory (with colour photograph), Peterborough Evening Telegraph: 1, 7 May. 6.30pm: Interview, Wales Today TV. Hart, Vanessa, 1996, BSE: cutting out the fear (with colour photographs of Brian J Ford and BSE book), Peterborough Evening Telegraph: 14-59 (central spread), 8 May. BJF, 1996, Brian Wave Column (26): God only knows, Mensa Magazine: 12, May. Cavagna, Anna G., 1996, Review of Images of Science, Annali di Storia Moderna e Contemporanea 2: 502-503. [Crawford, Alex], 1996, Eating beef causes kuru (front page lead story, with photograph), Laboratory News: 1, May. Blake-Coleman, B. C., 1996, General consensus [and] Salmons, Stanley, 1996, Dismay at harm, Letters to the Editor re National Science Weak, q.v., Laboratory News: 2, May. Report, 1996, Corgi snaps up title on BSE: The Facts, Diagnostics News: A1, May. Rhodes, Peter, 1996, Sheer madness (feature on BSE book), Birmingham Express, 10 May. Cuvelier, Monique, 1996, Book slates government handling of beef crisis (with photograph), Western Mail: 8, 9 May [see also promotional paragraph, p2]. Bassindale, Catherine, 1996, Mad cow or the cannibal disease? London Evening Standard: 30, 15 May. Elliott, Chris, 1996, Public just want truth about BSE says expert with photograph), Cambridge Evening News: 8, 16 May. MacConnell, Sean, 1996, Cheetah in Fota which died from BSE becomes focus of inquiry into disease (quotes BSE: The Facts), Irish Independent: 1, 23 May. Michael Ryan, Irish Radio, 11.00am, 23 May. Main news, Irish Radio, (recording) 3.30pm, 23 May. Arthur, Charles, 1996, Still searching for real facts (review of BSE: The Facts), Independent: 21, 23 May. Report, 1996, Soul mates (BJF to chair Mensa at Cambridge), Mensa Magazine: 5, [see also Mensa at Cambridge, the Golden Age, ibid: 35], June. Dale, Richard, 1996, Benefits of capitalism (letter re Brian J Ford article), Mensa Magazine: 7, June. Anon, 1993, Must this cow die? re BSE: The Facts, Front cover feature, Mensa Magazine, June. BJF, 1996, Complete and udder madness (re BSE), Mensa Magazine: 10-12, June. BJF, 1996, Brian Wave Column (27): Facts of Life, Mensa Magazine: 12, June. Klug, Aaron, 1996, BSE, the facts (with response from Brian J Ford), Letters to the editor, Laboratory News: 6, June. BJF, 1996, Brian Wave Column (28): The best is free, Mensa Magazine: 12, July. Announcement, 1996, BSE: The Facts, Mensa Magazine: 15, July. Russell, A., 1996, Bad timing (letter re Brian J Ford column on teaching), Mensa Magazine: 7-8, July. BJF, 1996, Science Column (14): Modern Marvels [low salt, plane doctors, skin eggs, couch disease], Boz magazine, 27: 4, July. Spedding, Sir Colin, 1996, (Brian J Ford on innovation quoted in) Agriculture and the Citizen, London: Champan and Hall, July. [Crawford, Alex], 1996, Blood bank warning about BSE-infected beef (quotes Brian J Ford and Creutzfeldt-Jakob disease), Laboratory News: 1, July. BJF, 1996, Bovine spongiform encephalopathy, Public Forum with Richard Lacey and Ben Willis, Derby University: SciTech, 1900h, 3 July. Lezard, Nicholas, 1996, Review of BSE The Facts, The Guardian, 19 July. BJF, 1996, Images Imperfect, the Legacy of Scientific Illustration, [chapter in] Yearbook of Science and the Future: 134-157, Chicago: Encyclopedia Britannica. An Evening with Brian - Mad Cows and Englishmen, 1900h, 22 July. Anton, Antony or Antoni? What was Leeuwenhoek's name? [address as Chairman of History and Art session, full paper postponed until 1997], 1630h, 24 July. The Sad Story of the Crazy Cow, 1630h, 25 July. Chicago: McCrone Research Institute. BJF, 1996, Brian Wave Column (29): Let's have fun, not fear, Mensa Magazine: 30, August. BJF, 1996, Interviews re vertical transmission of BSE, Newsnight (BBC2) 2230h, 1 August; Sky News 2245h, 1 August; Sky News 0700h, 0800h, 0900h, 2 August. BJF, 1996, Science Column (15): Modern Marvels [flywheel, stethoscope, venturestar], Boz magazine, 28: 4, August. Rowntree, Frank, 1996, review of Leeuwenhoek Legacy, Micspace book review, August. "Not only a major work of scientific scholarship but also a superbly written historical detective story.A task of great responsibility ... succeeded beyond measure. His book will undoubtedly become one of the Great Works of the literature of the history of microscopy." Announcement, 1996, Imitations of Life [promoting Brian J Ford's Images of Science, with colour feature], Barnes & Noble Catalogue: 7, Fall issue. BJF, 1996, Brian Wave Column (30): Uglies of the world Unite, Mensa Magazine: 12 [see also front page promotion], September. BJF, 1996, Creative Mind Management [lecture], London: Mosimann Academy, 1530h, 30 August. BJF, 1996, Interviews re BSE and Mensa Golden Jubilee, various radio and television programmes including Newsnight and World Service TV, not logged, August/September. BJF, 1996, Science Column (16): Modern Marvels [thought control, new neurons, magnetic fields, boulder], Boz magazine, 29: 4, September. Mims, Cedric, 1996, Review of BSE: The Facts, Biologist, 43 (4): 186-187, September. Report, 1996, Life's turning out peachy for scientist [with colour photograph], Peterborough Evening Telegraph: 13, 12 September. Report, 1996, Peach of a garden crop [with photograph], Peterborough Citizen: 7, 12 September. Burrell, Ian, 1996, Eating for Britain - risk in modern meals [quotes BJF on food poisoning]. Sunday Express: 16, 15 September. Deutsch, Daniel, 1996, Brownian Motion, now you see it, now you don't, [discusses BJF's research, in] Proceedings of the Royal Microscopical Society, 31 (3): 222-227. Spedding, Sir Colin, 1996, [discusses BJF on innovation, in] Agriculture and the Citizen: 222-223, with table 16.1, London: Chapman and Hall, September. BJF, 1996, BSE, presentation to Polynous, Cambridge: Trinity College, 1100h, 19 September. BJF, 1996, Address at King's School speech day prize-giving, Peterborough Cathedral, 1430h, 20 September. Brian J Ford former Chairman of Old Petriburgians Association, Peterborough: Bull Hotel Menu, 21 September. BJF, 1996, Chairman's address, inaugural History Sector luncheon, University College, Crewe, 1445h. Reported, with colour photograph, in Manchester Metropolitan University Newsletter, 33: 4, see December. BJF, 1996, Ethnic Foods [lecture], London: Mosimann Academy, 1500h, 25 September. BJF, 1996, Brian Wave Column (31): Without due Cause, Mensa Magazine,: October. BJF, 1996, Lecture: BSE - The Facts, Branch Meeting of the Institute of Biology, Cardiff University, 1900h, 2 October. See also: posters and announcements. BJF, 1996, Science Column (17): Modern Marvels [taxi germs, contraceptive museum,hard water magnet, resistant staphylococci, new coffee], Boz magazine, 30: 12, October. Report, 1996, New Guinness Quiz book competition, Newcastle: Sunday Sun, 6 October. BJF, 1996, Lecture: BSE and the Public, Townswomens Guild Conference, Newcastle City Hall, 1130h, 29 October. Biography, 1996, Brian J Ford [in] Dictionary of International Biography, 24th edition, 1996, Cambridge: IBC. BJF, 1996, Brian Wave Column (32): Sounds fishy, Mensa Magazine: 12, November. BJF, 1996, Lecture: BSE and the Public, Townswomens Guild Conference, Nottingham: Poswt House, 1430h, 18 November. Anon, 1996, Brian J Ford (with Sir John Maddox) chairing Institute of Biology/Royal Pharmaceutical Society symposium, 20 March 1997, Biologist 43 (5): 234. BJF, 1996, Science Column (18): Modern Marvels [koala, ozone, organ store, Mediterranean], Boz magazine, 31: 11, October. Ruestow, E G, 1996, cites Brian J Ford's Revealing Lens (1973), Single Lens (1985) and Leeuwenhoek Legacy (1991) in The Microscope in the Dutch Republic, The Shaping of Discovery, Cambridge: University Press. BJF, 1996, Lamenting the loss of the micron, The Microscope. BJF, 1996, [Editor] Biology History, 8 (2 & 3): 60pp, December. BJF, 1996, Science Column (19): Modern Marvels, Boz magazine, 31: 11, November. Burrows, Peter, 1996, Clinical evidence (commenting on Brianwave No 31, October) Mensa Magazine: 7, December. [BJF, 1996, The Biodiversity meeting at Leiden and European zoological research, Global Biodiversity Research in Europe, Frankfurt: Senckenberg Institute, 1600h, 10 December]. BJF, 1996, Confirming Brown's Observations of Brownian Movement, Proceedings of the Royal Microscopical Society, 31 (4): 316-321. BJF, 1996, Science Column (20): Modern Marvels [resuscitation, banana vaccine, smoking, bifida, baldness], Boz magazine, 32: 11, December. Wormald, Mark, 1996, cites Brian J Ford's Revealing Lens (1973) and Single Lens (1985) in Microscopy and Semiotic in Middlemarch, Nineteenth Century Literature, 50: 501-510. BJF, 1996, Brian Wave Column (33): Au revoir, Mensa Magazine: 16, December. Cooke, Peter, 1996, cites Brian J Ford in Review of Chemical Microscopy, Analytical Chemistry, 68 (12): R333-378. BJF, 1996, guest appearance with Scott Chisholm, New Years Review, National Talk Radio, 31 December, 0900-1000h. BJF,1996, Zmogaus kûnas, Kaina kitur: Lt 5.00, Mûsø kaina:Lt 4.10, Jûs sutaupote: 18 % Leidykla: ISBN: 9985-0-0212-1, Puslapiø skaièius: 61, Formatas: 20x26 cm. Lithuania: Vilnius. Move to next year or previous year.